As reported in FreshPlaza, Indian mangos constituted 40% of the India’s fruit exports in 2008, the volume doubling since 2007 to 300 tonnes. 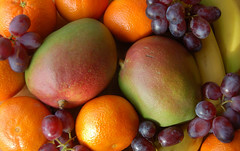 Indian mangos are now popular in the US, which only permitted imports of Indian mangos in 2007. The mango imports to the US were subject to a bilateral trade deal with two conditions. Indrajit Basu reported in Asia Times that the US agreed to import Indian mangos in exchange for India relaxing its emissions standards that normally apply to vehicles to allow the import of Harley Davidson and some other high-end, large engine, more polluting motorbikes. The other condition was that all the mango imports to the US must be irradiated. This mandatory irradiation is being given a positive spin as preventing the risk of food poisoning and as an alternative to pesticides. I think it is more about extending the shelf-life of the produce and using trade deals to ensure the expansion of industrialisation of our food supply. Construction of massive irradiation plants for mango and other produce exports is underway all over India including at Hyderabad and Lasalgon near Nasik. Now, the Financial Express reports that exporters, courier services and even plane passengers are being informed by APEDA, India’s Agricultural and Processed Foods Export Development Authority, that no movement of mangos of any form into the US is allowed unless the fruit is irradiated.